For the younger generation of world travellers, there is one item they cannot do without – a Lonely Planet guide. Although Myanmar still lacks a reputation as a budget destination as compared to its Southeast Asian neighbours, the country is nevertheless attracting an increasing number of backpackers who are keen to visit a country which was closed off from the world for so many years. Few of these self-respecting young foreign tourists doing the rounds in Myanmar would be seen without a copy of this trusted guide – particularly as online information is relatively scarce and can be time-consuming to access due to slow internet speeds. And which image was considered alluring enough to be featured on the cover of Lonely Planet’s 2011 edition? 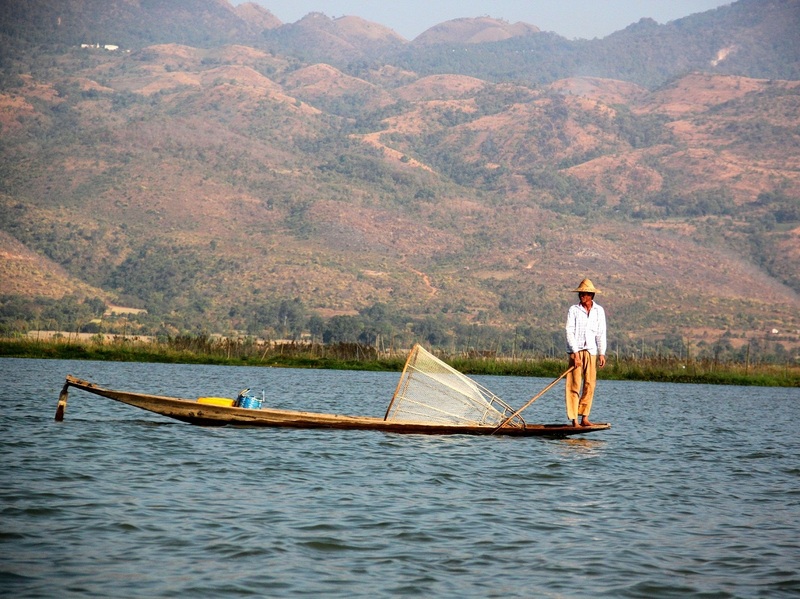 A fisherman standing on his traditional boat on Inle Lake. Its allure makes it impossible to travel to Inle Lake without trying to snap a shot of this symbol of life in Shan State. The lake is one of Myanmar’s top tourist draw cards – so much so that if I had a kyat for every time I’d been asked whether I’d been there, I’d have at least a thousand more to my name than I do right now. Over time, the omission became something of an embarrassment, particularly after admitting I’d been living in Myanmar for more than 18 months. Envy also kicked in: I’d heard story after story about the lake’s scenic splendour, the fascinating cultural mix of the area’s indigenous groups and the laid back vibe of Nyaung Shwe, where everyone but the high-end travellers stay. So finally, in January this year, my husband and I booked flights to the “Big Two” – Bagan and Inle Lake, Lonely Planet guides in hand. Obviously my expectations were extremely high – to the point of thinking it inevitable I’d be let down. After a few dusty but enchanting days zooming about Bagan’s temples on electric bicycles, we somewhat nervously boarded an Air KBZ flight to Heho Airport, which is located about an hour from Nyaung Shwe. The airport is notoriously difficult for landing because it’s located in mountainous terrain and the landing strip is short – factors considered attributable to Air Bagan’s fatal accident on Christmas Day 2012. However I was comforted by the fact that the aircraft, which carries around 70 passengers, was obviously a far newer model than that which we’d travelled to Bagan with Air Mandalay (it had ashtrays in the toilets). Nevertheless it was still something of a relief to step off the plane in Heho and breathe in the cool, crisp morning air – which I soon discovered drops to a downright chilly 14 degrees Celsius at night in the peak season of December and January. Most trips to explore Inle Lake begin around 8am, but it’s also possible to hire a boat at any time of day, for as many hours as you wish. Having arrived around noon, our first venture on the lake took place just before sunset. Our guides were a friendly Intha father and son – although their English was limited, the teenage son was able to communicate the basics – and most often the scenery spoke for itself. 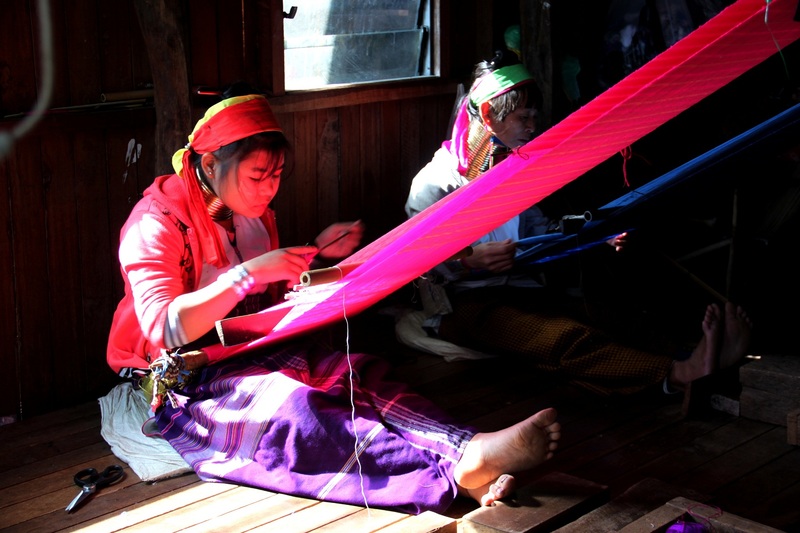 The Inthas are a predominantly Buddhist Tibeto-Burman ethnic group and are thought to have migrated from Dawei to Inle Lake back in the 14th century. Legend has it that two Intha brothers were summoned to serve a Shan chieftain, who was so taken with their work ethic that he invited another 36 families to follow them. Today the Inthas number around 70,000 and speak a Burmese dialect. 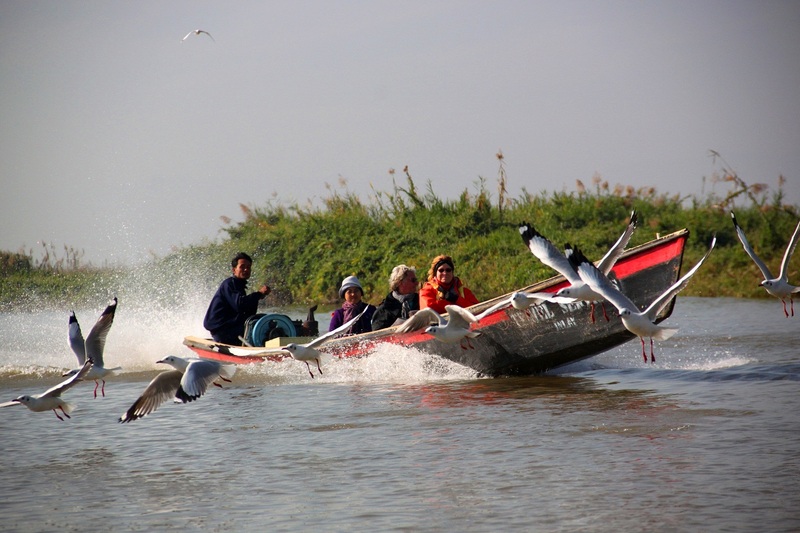 “Intha” translates to “sons of the lake” – along with fishing and tourism, tending floating gardens is a common form of livelihood for the Intha people. Be prepared to bargain hard if you’d like to own something as beautiful as this! As the sun’s rays slowly turned into shades of muted pinks and mauves and we donned the woollen blankets offered to guard against the chilly winds, our guide pointed out half a dozen fisherman on boats a hundred or so metres away. The Intha’s unique rowing style involves wrapping one leg around a paddle (creating a silhouette that bears a slight resemblance to a wooden-legged pirate), and it has become one of Myanmar’s most iconic sights. An Intha fisherman is also featured on the cover of Lonely Planet, which must be at least part of the reason why virtually every tourist visiting Inle Lake is determined to take home some of their own photographs of the famed sight. Sure enough, we saw about 40 tourists in motor-powered boats snapping away with glee. “If you want to get closer you’ll need to pay [the fishermen] a tip,” said our guide, before hinting that posing for pictures has become so lucrative that for some, it’s trumped the pursuit of fishing itself. As if on cue, a handful of the fishermen lifted their cylindrical nets by their legs and extended the oars in perfect unison – but held the pose for less than five seconds. The following morning we returned to the lake for a full day excursion with our guides – which is great value at a little over $30 for two people. We sped along the vast waters, which are 22km long by 10km wide and flanked by mountains either side. 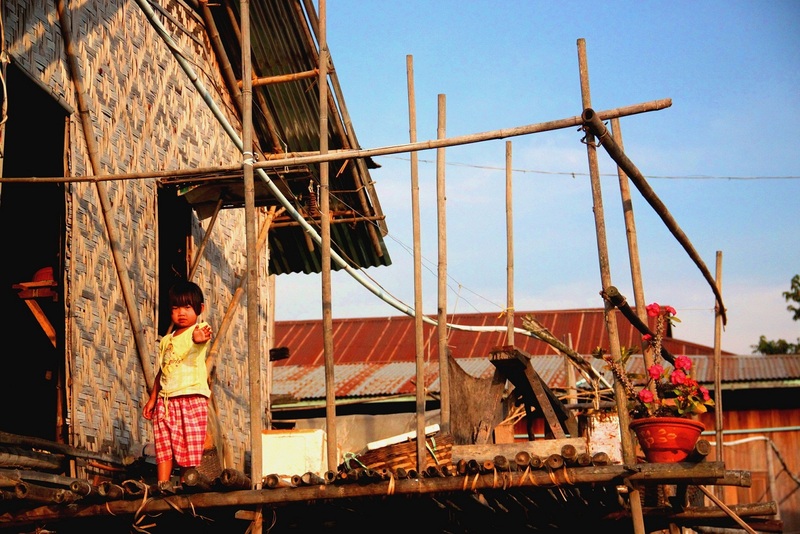 We slowed down to navigate through the narrow spaces left by fertile reeds and I gazed in amazement at the communities of stilted homes, most of which are fragile structures of thatched bamboo and others of more robust but rusted metal sheeting. 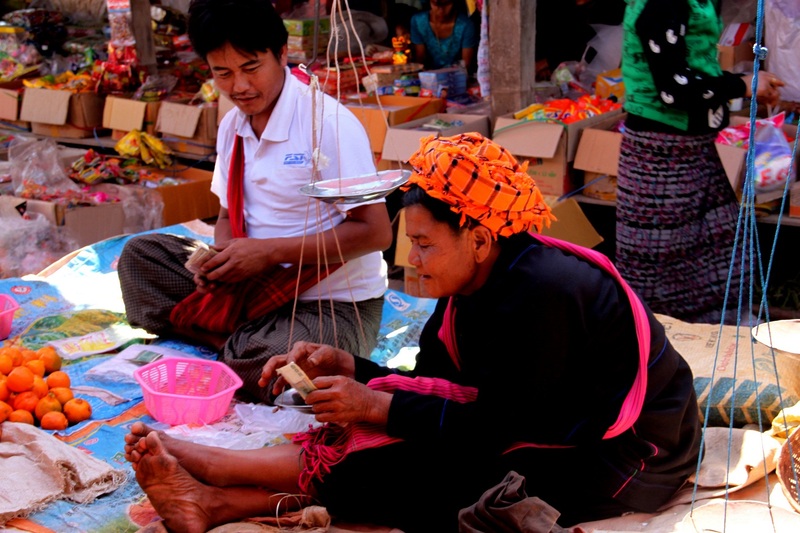 Inle Lake has a countless number of floating villages, floating gardens and markets, the latter of which offer everything from stunning silver jewellery, Shan parchments, parasols, ox bone spoons and spices – but be prepared to bargain because trade is largely geared towards tourists. There are also monasteries and atmospheric stupas, such as Shwe Inn Thein Paya, which has hundreds of densely packed stupas, both ruined and vigorously restored. Nga Hpe Kyaung Monastery is made entirely of wood and has a huge meditation hall featuring Shan, Tibetan, Bagan and Ava style statues. 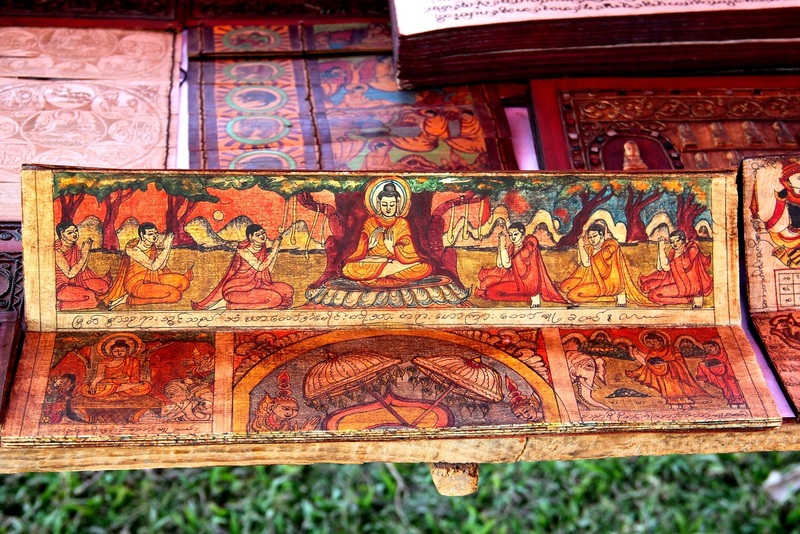 It was built in 1853, four years before the construction of Mandalay Palace began. In recent years the monastery gained fame for its cats, which were trained by a monk to jump through hoops (and were amply rewarded for doing so). However according to our guide, the monk passed away last year and the unusual spectacle is no more, as the other monks aren’t as keen on cat tricks. Nonetheless the monastery has retained its plentiful feline population and it’s amusing to watch scores of tourists avidly taking their portraits. Most boat trips return to Nyaung Shwe around 4pm, so a pleasant way to pass the time before an evening meal is to try a traditional Intha massage at Win, which is on Shwe Chan Thar Street and costs just K5,000 for an hour. It’s family-run and massages are performed in a breezy bamboo hut, with Shan tofu crackers, coconut cookies and green tea served afterwards. Intha massage is quite gentle in comparison to the traditional Burmese style, although those who prefer a firmer touch need only request it. Having read in Lonely Planet Myanmar that “Nyaung Shwe’s culinary scene doesn’t quite live up to its atmosphere,” it was a pleasant surprise to stumble upon a Japanese restaurant located just around the corner from Aung Mingalar Hotel ($50 per night). The chef is of Japanese descent and the ramen was as good as I’ve ever tasted. With the exception of an Italian restaurant called Golden Kite (which boasts authentic wood-fired pizzas), every restaurant we dined at was established too recently to have been listed in the 2011 edition ofLonely Planet. Two establishments stood out among the rest – the first was Everest 2, which is run by a family descended from Pokhara in Nepal. While its biryiani was disappointing, the thali was memorable and the chai divine. 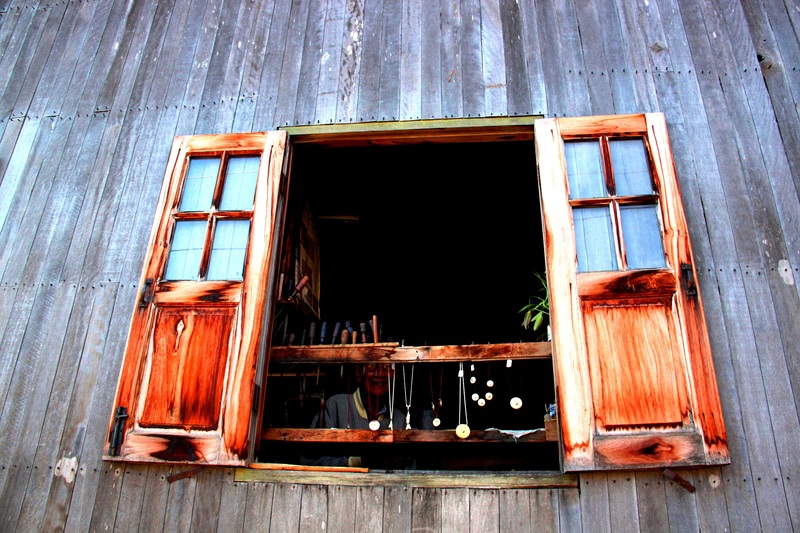 The French Touch is located on a side street called Kyaung Taw Shayt Street, but its bright orange outside decor is impossible to miss from the main road of Yong Gyi, which leads to the canal from where boat trips are booked. It boasts a bakery, restaurant, free wifi and even a spa. The pizzas are large and its host of cocktails, including its trademark “Frenchtouchtini”, makes it an excellent spot for a sunset cocktail, which will more than likely morph into an after dark dinner. When I accidently dropped my third martini, the shards of glass were swept up with an understanding smile and a fresh replacement was delivered to the table before I could even offer a proper apology. Although there’s no longer a shortage of options serving international cuisine, sampling Shan food is a must. Aurora Restaurant on Yong Gyi Street serves up delicious, hearty meals which often feature a base of stewed tomatoes, which I chose to have accompanied with chunks of potatoes and melt-in-your-mouth slices of eggplants. It’s also perfect if you’re on a tight budget, as prices are about K3,000 for a main meal. 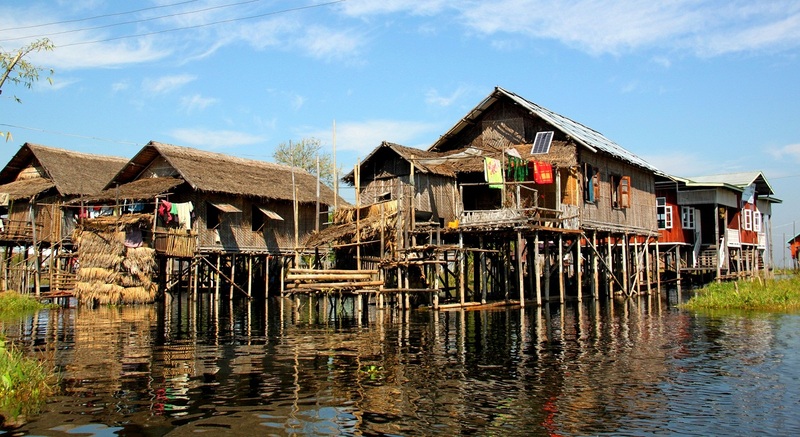 As an ever-increasing number of tourists visit Inle Lake, some are concerned that it will soon lose some of its charms and become far more commercialised than it is today. Personally, I have my doubts, as the area itself is so vast and the sights so plentiful – but regardless, anyone who hasn’t yet been is missing out – just as I (eventually) discovered.